caliber missile why named so ? AFAIK the name calibr is for the missile family whose export name is Klub. It is a land attack subsonic missile and a subsonic and subsonic/supersonic anti ship missile that evolved from the grannat nuclear armed cruise missile from the 1980s. It is not a standard name for all new missiles... the existing Onyx missile has the export model Yakhont, which was developed with India to create Brahmos. The replacement Zircon is also being worked on with India in an export version too. Note the domestic names relate to geological names... ie Granit, Amethist, Vulcan, etc etc. In normal use Calibre = the diameter of a gun barrel. For the missile its a family name including multiple quite different missiles. Think of it like how US navy has Standard (Standard = military flag) as a family name for a bunch of SAMs. Nice! A 21820 LCT clearly lacks endurance and open-ocean sea-worthiness, but extend the concept to RoRo container vessels and you have a nice "arsenal ship". No smarts and reliant on external C&C and targetting info, but provides a big boost to taskforce ordnance in operations such as wiping up terrorists in Syria. Use 'em up early and send the civvie home. It would be prudent to place an order for significant quantities of such containerised systems, and stockpile them at military ports as a rapid response contingency. Love the phrase "transportation reticence" used to describe the components housed in standard marine containers. Whoever came up with that knew his English. They'll need new launcher for these. I assume approach will be for this new one to ba able to load and fire several standard Kalibr or Redut AA missiles using adapters? Or they change the upper part. 4 big Kalibr-M instead of 8 Kalibr. Or maybe not. The original Kalibr probably was purposely filled with lower calorie fuel, and probably some of the better fuel (reserved mostly for Kh-101) was never installed. Of course as what GarryB has stated, because it's launched from ground/naval platform it loses some range (approx 1000km), as opposed to air-launched (5500km air launch vs 4500km surface/sea launch). The fact that it is called Calibr-M shows it is based on the Calibr missile, but it may use more efficient fuel, more fuel in a redesigned shape, that has more efficient turbofan engine as fitted to the Kh-101/102 air launched missiles. Keep in mind that the Kh-101 is only 2.5 tons... the Kh-55SM is 1.5 tons so it is only one ton extra of onboard fuel and a more efficient engine that extends its range from 3,000km to 5,500km. The ship launched Calibr is also about 1.5 tons, but then the Brahmos is 3 tons in the surface launched model (2.5 ton in the air launched model), so even if it was 2.5 tons it would not be the heaviest missile already carried in the UKSK launcher. If they are making the UKSK launcher bigger, in the form of the UKSK-M then I rather suspect it is because they want to add the S-500 SAMs but they are likely to be much too big to fit into Redut. The other day, literally, information passed that the development of a new version of a cruise missile with a range of more than 4500 km Caliber-M was begun. A source in the defense industry told TASS about it. "For the Navy, the newest high-precision ship-based Kalibr-M cruise missile with a maximum firing range of more than 4.5 thousand km is being developed. The creation of the rocket is at the stage of research and is financed by the Ministry of Defense." The rocket is included in the state program of armaments for 2018–2027, and therefore, until 2027, it should be entered into service with the Russian Navy. It is also reported that the rocket will be larger and the mass of the warhead close to 1000 kg. 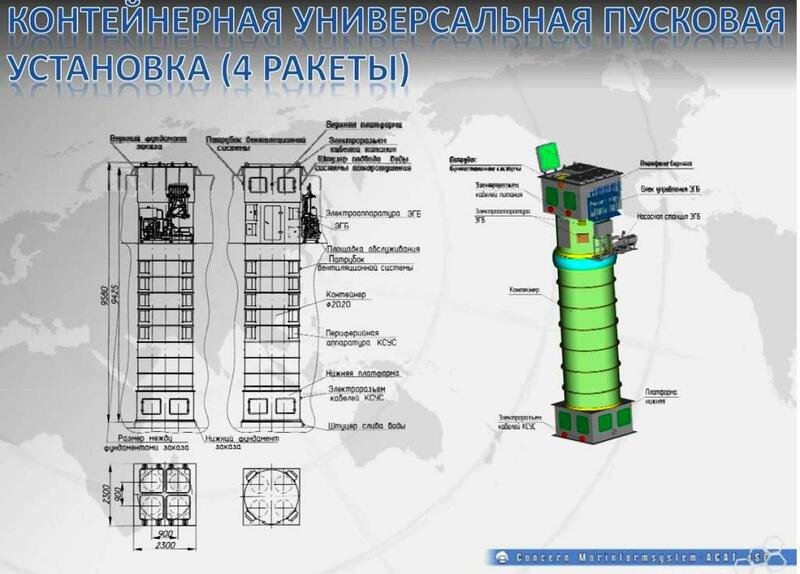 New rocket is planned to equip large surface ships, starting with frigates, as well as nuclear submarines. As well as the progenitor of the new rocket will be able to carry both nuclear and conventional combat units, and will be designed to defeat ground objects. I propose to start with dimensions: the Caliber 3M-14 rocket in its maximum configuration (let's say) has a caliber of 533 mm and a length of up to 8220 mm, and a mass of 2300 kg. In this case, it is considered that its range is 2000-2500 km. With a warhead weight of about 500 kg. Immediately make a reservation - the mass of a nuclear warhead can be significantly less - for example, 150 kg. The use of such missiles on shipboard ships is provided with a launcher of a vertical launch of the 3C-14 type. The same launchers 3C-14 are also used as the Onyx 3M-55 anti-ship missiles. TPK which has a length of up to 8900 mm and a diameter of up to 720 mm, the mass of the rocket is not less than 3000 kg. It is not difficult to assume that the available reserves allow to carry out a rocket "type 3M-14" with a diameter of 700 mm instead of 533 mm and a length of 8900 mm instead of 8220 mm, which gives just at least 200 kg of additional fuel, but taking into account the optimization of the layout (I think that there are reserves, taking into account the age of the current missiles, will actually give more than 300 kg of additional fuel. And taking into account a more optimal aerodynamic shape, as well as more high-energy fuel, as well as updating the engine, it will fully provide a corresponding increase in flight range. Yes, it is likely that the shape of the new missiles will be less round and more flat-square-diamond. The marching engine most likely will not move out of the hull. The start will be smaller in size. Perhaps in the new UBCS there is a reserve for larger-diameter missiles — then the task will be a bit simpler. By the way, with a modular design (and why not?) With such a nuclear missile, the range can be even more. Or maybe 4500 km - this is exactly the range with a nuclear charge? Then, in general, you can do almost nothing - learn how to put a rubber tank instead of half the combat compartment and fly. Just kidding, of course.